Victaulic to Exhibit and Announce New Innovative Fire Protection Solutions at NFSA! The NFSA 2015 Annual Seminar and North American Fire Sprinkler Expo is quickly approaching, running April 29 through May 2 at the Hilton Bonnet Creek in Orlando, Florida. This year, Victaulic is looking forward to sharing new, improved and existing products that continue to shape the fire protection industry, along with a very special announcement surrounding new product offerings. Are you planning on attending the NFSA Annual Seminar and Expo this year? If so, stop by our booth, #300, for the opportunity to learn about our range of fire protection solutions, including the VicFlex™ brackets for hard-lid ceilings, design improvements to the FireLock™ Fire-Pac, a new protective sprinkler coating, and so much more! The VicFlex Flexible Sprinkler Fitting System offers various solutions for fire protection applications. The Style AB2 Bracket for hard-lid stud ceilings and the Style AB4 Bracket for hat furring channel hard-lid ceilings reduce installation time by as much as 60 percent while eliminating problems associated with hard pipe drops, such as MIC. The VicFlex Series AH2 Braided Hose is a 100 percent kink resistant hose providing the most allowed bends and featuring a cULus listed 2-inch bend radius (the tightest on the market! ), resulting in quick and efficient installations. Be sure to stop by and ask about our industry training opportunities to learn more about flexible drops or email victaulicuniversity@victaulic.com for more information. Featuring more customizable solutions with the an even smaller overall height, is the Victaulic FireLock Fire-Pac Series 745, a pre-assembled fire protection valve and trim that comes pre-wired to a fire alarm control panel or junction box and enclosed inside a metal cabinet. The design improvements come from the close relationship Victaulic has with its customers. 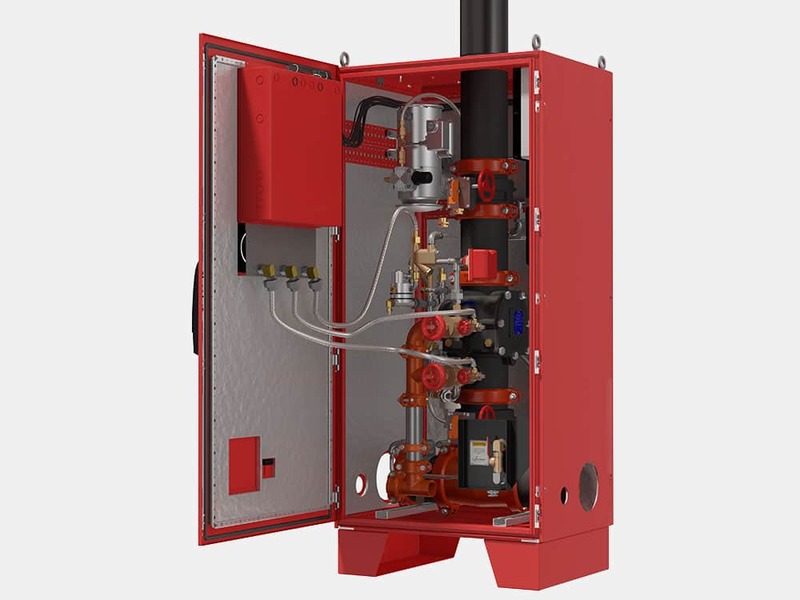 The improved Fire-Pac provides greater application options by featuring sealed cabinets with heating and insulation for outdoor installations, while maintaining a small footprint reducing space requirements, more inlet pipe and drain connection options and a greater ambient temperature range, all within the same footprint as the original. The VC-250 Sprinkler Coating for Victaulic FireLock™ Sprinklers delivers superior corrosion resistance through a proprietary composition and application process across a range of corrosive environments. The coating fully encompasses the sprinkler frame with a uniform thickness, preventing areas of vulnerability, as is often the case in other coatings. Sprinklers with the VC-250 coating can be used in water treatment, food manufacturing, ethanol production and pickling stainless steel lines. Victaulic will also be featuring the FireLock™ V31 ECLH Sprinkler line & FireLock™ Commercial Zone Control Riser Module – Series 747M, designed for commercial wet sprinkler systems featuring waterflow switch alarm connection, pressure gauge and an alarm test. In addition to Victaulic’s extensive line of products featured at the show this year be sure to take advantage of our Victaulic experts and learn more about our service offerings too, including the unique best-in-class partnership we have with the United Association (UA) and the new mobile education-training program offered to fire sprinkler fitters. 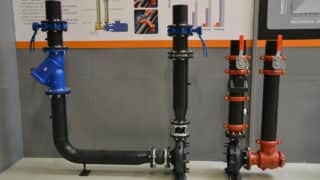 As well as, the Victaulic Construction Piping Services’ (CPS) group and how they are playing a larger role in the fire protection industry. Last but certainly not least, Victaulic has been committed to innovation since 1919 and in 2015 we will continue this legacy. Be sure to visit us at our NFSA booth (#300) to find out how! If you’re not able to stop by our booth this year, no worries – we will be sharing live updates from the show on Facebook, Google+, LinkedIn and Twitter, so be sure to follow us!